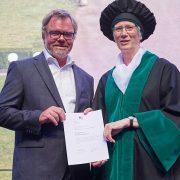 HALBAN The academic affiliation agreement between GUtech and its German partner-university, RWTH Aachen University, was renewed during the Board of Governor’s (BoG) meeting that was held at RWTH Aachen University, in the city of Aachen (Germany) end of June. The meeting was chaired by the current Rector of RWTH Aachen University, Prof. Dr.-Ing. Ernst Schmachtenberg. “We are very glad that we have renewed the contract for another five years with our German partner-university RWTH Aachen University. The collaborative agreement will support all our activities in research and teaching as well as the overall knowledge-transfer between Germany and the Sultanate of Oman,” said Prof. Dr.-Ing. Michael Modigell, Rector of GUtech. Two new board members representing the Omani Academia, H.E. Sheikh Dr. Al Khattab Al Hinai and Dr. Bader Al Kharusi, were welcomed to the board meeting. In addition, the BoG agreed to establish the position of a Deputy Rector for Research and Innovation at GUtech in the coming months. The BoG meeting at RWTH Aachen University was the last meeting chaired by Prof. Dr.-Ing. Ernst Schmachtenberg, who will retire this month. On this occasion, H.E. Sheikh Abdulla Salim Al Salmi, Representative of Oman Educational Services LLC (OES) presented a gift to the Rector and thanked him for all his support during the past four years. Initially, OES and RWTH Aachen University signed the first affiliation agreement when GUtech was established in Muscatin 2006. The university opened its doors in September 2007 when 60 students started their studies at GUtech. In summer 2018, nearly 2,000 students were studying in the Foundation Year Programme as well as in various BSc and BEng programmes such as Applied Geosciences, Urban Planning and Architectural Design, Computer Sciences, International Business and Service Management, Logistics, Mechanical Engineering, Process Engineering and Environmental Engineering. HALBAN The OmaniExpo showcasing research projects in Engineering, Economics, Health and Environment as well as in Natural Sciences and in Mathematics was held at the German University of Technology in Oman (GUtech) yesterday evening. All research projects were conducted by Omani students who are studying abroad. The one day exhibition included a large number of research posters and a competition for the best three research projects. The initiative was organized by the Computer Science Club of GUtech and the Blockchain Club in Oman. The exhibition was held at Sultan Qaboos University in 2016. Al Munther Al Musalhi is one of the founding members of the exhibition and a committee member of the OmaniExpo 2018. Al Munther studied Mechanical Engineering at Oregon State University. “Through this event we wish to promote the Omani youth, while connecting the students and their innovative ideas with the Omani community,” he said. The exhibition showcased 12 engineering projects, 7 projects on health and environment, 7 projects on Maths and Sciences and two projects on economics. “Our criteria for the competition are the benefits of the research for the community in Oman and the novelty of the student research project,” said Al Munther. His fellow committee members of the OmaniExpo 2018 are Mazin Al Fanna, Ahmed Al Manji, Hassan Al Balushi, Said Al Jabri, Yusra Al Sawaii and Al-Khatab Al Busaidi. “I am delighted to speak to many Omani students studying abroad who are showcasing their research during this special exhibition. I think the event will encourage students at school to excel in their studies and to register at a university of their choice in order to pursue their dreams. The group of alumnis from Oregon State University has worked more than one year on organizing this event. We are very grateful for GUtech’s support in hosting this exhibition,” said Dr. Talal Mohammed Al-Balushi, Cultural Attaché at the Embassy of the Sultanate of Oman in Washington (USA) during the exhibition. Zumurda Ahmed Al Rawahi studied Material Science and Engineering at the University of Washington (USA). She presented her BSc research on a new material used in the production of biomedical implants. She hopes to promote the manufacturing of these implants here in Oman. She is currently working on publishing her findings along with her professors in an American biomedical journal. Zalikha Al-Marzouqi is a PhD student at the University of Manchester (UK). In her research in health sciences she focuses on the perception of Omani women on breastfeeding and the support they get from the society at large. 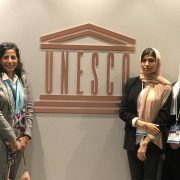 “The aim was to gain an in-depth understanding of exclusive breastfeeding of Omani women and to enhance our understanding of the reality of breastfeeding from the perspective of their family members and health care professionals in Oman,” explained Zalikha. For her research she conducted 61 interviews and 15 clinical observations in the past years. According to the World Health Organization is breastfeeding is an important factor in promoting a child’s health and it should be done for around two years. “Most women adapt themselves to the society. According to my study the majority of the Omani women stopped breastfeeding their babies already after 4 months,” she said. The organizing committee of the OmaniExpo 2018 is planning to launch more such events in future. HALBAN To foster the links between the academia and the industry, the first of its kind SAP Next-Gen-Lab in Oman was inaugurated at the German University of Technology in Oman (GUtech) in cooperation with SAP, one of the leading enterprise software corporations yesterday afternoon. The laboratory was launched by members of the Rectorate of GUtech and the SAP Country General Manager, Mr. Waheed Al Hamaid and in the presence of a number of representatives from the industry in Oman and from the German Embassy. “There are currently around 100 SAP Next-Gen Labs worldwide. These special laboratories provide students with knowledge and skills for a digital future. They also connect the SAP ecosystem of customers and partners with students to work on SAP Next-Gen projects and events to connect companies recruiting next generation leaders with students and graduates who have digital transformation knowledge and skills and to showcase their start-ups with corporates seeking to create innovative solutions,” said Waheed Al Hamaid. 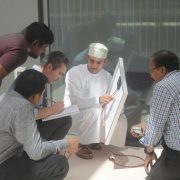 “We are very honored to introduce the first SAP Next-Gen-Lab here at GUtech. We wish to create a special space where our Computer Sciences, Engineering, Geosciences, International Business and Logistics students can interact with companies worldwide and work with them on industry-related challenges, for example in the Logistics sector. This laboratory is a co-creation between the academia, students and the industry. It is a working space built on design-thinking principles to stimulate and encourage innovative thinking, collaboration and knowledge-sharing,” said Dr. Hussain Al Salmi, Vice-Rector for Administration and Finances at GUtech. The SAP Next-Gen Lab connects customers to academic ‘thought leaders’ and researchers, students, start-ups, business accelerators, tech community partners, venture firms, futurists and SAP experts. 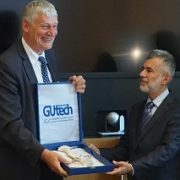 “This unique cooperation will also help build innovations linked to the 17 UN Global Goals for Sustainable Development,” said Heiderose Moossen, Manager Training and Smart Solutions Center (TSSC) at GUtech who initiated the setting up of the Next-Gen Lab at GUtech. Similar SAP Labs already exist on the Arabian Peninsula in Saudi Arabia, at Prince Sultan University, at King Abdulaziz University and in the UAE. Group photo during the opening of the SAP Next-Gen-Lab, inaugurated at the German University of Technology in Oman (GUtech) in cooperation with SAP. HALBAN GUtech will hold a two week Summer Academy for teens on its campus in Halban between the 22 July and 2 August. The GUSummer Academy will be held in Arabic. Its programme is designed for students aged between 14 – 17 years, with the aim to support students to be responsible for their daily tasks and to become independent thinkers. Since it was launched for the first time in 2015, the summer programme has been one of the most successful summer schools in Oman. Different workshops such as English, German, Business, IT, Photography, Arts, Health and Safety, Car Maintenance and Sports promise to prepare and inspire the young students for their next school years and for life. 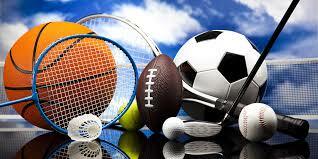 In addition, leisure activities such as a leisure hunting safari will be conducted outside the campus. Overall, this special summer programme focuses on enhancing the student’s educational and personal growth. For more details and registration, please visit http://summeracademy.gutech.edu.om or check out GUtech on social media: gu_summer_academy. MUSCAT A group of 15 GUtech students and two supervisors will participate in a special language and culture course to be held at GUtech’s German partner-university RWTH Aachen University in August. 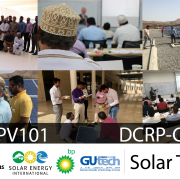 Since 2009, the annual 3 week study-trip has been conducted in cooperation with RWTH Aachen University and the German Academic Exchange Service (DAAD). DAAD has been funding the study trip every year. The main aim of this special course is to introduce the students to life in Germany and to the different faculties at RWTH Aachen University. “Studying the German language was not so difficult, only in the beginning,” said Murooj Al Busaidi, 3rd year student in BSc Computer Sciences who has studied German for three semesters. She is looking forward to applying the language and experiencing the country soon. Like most of the other GUtech students, Murooj will be traveling for the first time to Germany and to Europe. “I like to learn more about Europe and especially about Germany. I am planning to do my Master’s there,” said Huda Al Jahwari, BSc Logistics student. “Aachen is a student city and the university has many different departments including a well-known Logistics Department,” explained Huda. Mustafa Mohammed is studying Mechanical Engineering in the 3year at GUtech. He has been receiving a study scholarship from the Egyptian and Omani governments. “RWTH Aachen University is one of the leading universities in Europe. I am very happy to get the opportunity to attend this special language course and to get to know the university. I am planning to study my Master’s in Germany,” said Mustafa. GUtech offers German language classes for beginners for all BSc or BEng students. For the language course the students had to submit a letter of motivation and other documents. The selected candidates were then interviewed by the selection committee. “This year we had an increased number of applicants. More than 100 students from all academic programmes applied for only 15 seats. One of the requirements was that they had studied one or two semesters German,” said Claudia Schmidt, Representative of the DAAD and German Lecturer at GUtech. For most of the students it is their first trip to Germany. Students from the departments of Applied Geosciences, Engineering, International Business and Service Management, Computer Sciences will attend the course. GUtech promotes study and research exchange especially with RWTH Aachen University and with other universities in Europe. Caption: Group photo with the GUtech students who will participate in the Language and Culture Course at RWTH Aachen University as well as their two supervisors, Claudia Schmidt from the DAAD (first row) and Felixa Wingen from the International Office at GUtech.